Professor Peter Klaus is a University Professor and holds a PhD in Business Administration awarded by the Graduate School of Management, Boston University (1983). He also has a Master of Science in Transportation from Massachusetts Institute of Technology (1982). Organizational and Behavioural Approaches to Service Industry Issues. LEHRSTUHL FUR BETRIEBSWIRTSCHAFTSLEHRE, INSBESONDERE LOGISTIK, Friedrich-Alexander- Universitat Erlangen-Nurnberg (1990 -2009). He was also the Professor for Business Administration, at FACHHOCHSCHULE FUR WIRTSCHAFT, Pforzheim. Prof. Klaus has published four books and more than 100 academic journals and articles. Some of his focuses included Logistics and Supply Chain Management in Central Europe and the various Decision Support Systems applications in logistics. In addition, he is the editor-in-chief for Logistics Research, an international academic journal in the field of Logistics and also the editor for Edition Logistik, a series of research monographies in logistics. Prof. Klaus is nominated to Logistics Hall of Fame by Logistics Inside, a trade journal and has received several awards including DHL Innovation Award under the “Senior Scientist” category. 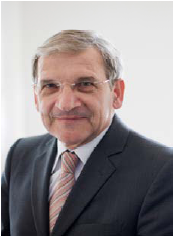 He is also the chairperson for various advisory boards such as MULLER Die LILA LOGISTIK.